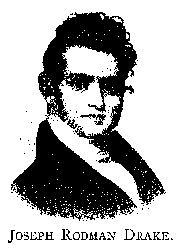 Joseph Rodman Drake (August 17, 1795–September 21, 1820) was an early American poet. Born in New York City, he was orphaned when young and entered a mercantile house. While still a child, he showed a talent for writing poems. He was educated at Columbia. In 1813 he began studying in a physician's office. In 1816 he began to practice medicine and in the same year was married to Sarah, daughter of Henry Eckford, the naval architect. In 1819, together with his friend and fellow poet Fitz-Greene Halleck, he wrote a series of satirical verses for the New York Evening Post, which were published under the penname "The Croakers." Drake died a year later, of consumption, at the age of twenty-five. A collection, The Culprit Fay and Other Poems, was published posthumously by his daughter in 1835. His best-known poems are the long title-poem of that collection, and the patriotic "The American Flag." Fitz-Greene Halleck's poem "Green be the turf above thee" was written as a memorial to Drake. Shall look at once to heaven and thee. And fixed as yonder orb divine. The guard and glory of the world.